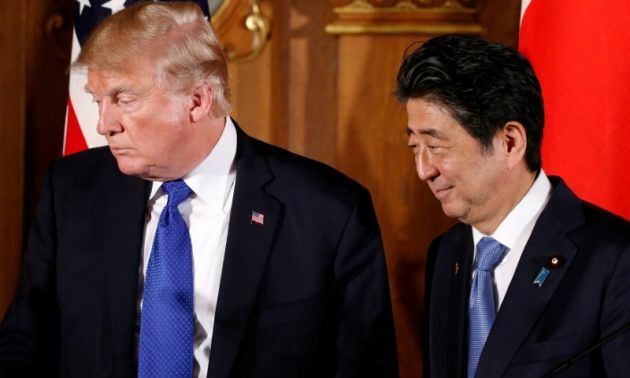 EghtesadOnline: Tariffs on steel, threats of car import levies and intense pressure for a two-way economic deal: despite warm personal ties, U.S. President Donald Trump is giving Japanese Prime Minister Shinzo Abe a decidedly tough time on trade. Trump has also withdrawn from a multilateral Trans-Pacific Partnership (TPP) promoted by Abe as a counterweight to China, abandoned a climate change accord backed by Tokyo and is pursuing talks with North Korean leader Kim Jong Un notwithstanding Abe’s warnings about past mistakes, according to Reuters. “I think he has penetrated Trump’s mind to a certain degree, but that is different from his pet agenda on trade,” said Keio University professor Toshihiro Nakayama. “Prime Minister Abe and his team expected a bit more because of the personal chemistry. That was a bit of wishful thinking - look at Macron,” Nakayama added. Like Abe, French President Emmanuel Macron has developed a strong personal relationship with Trump yet has clashed with him over issues including Iran, climate change and trade. Trump’s administration decided last week to begin a national security investigation into auto imports that could lead to new U.S. tariffs similar to those already imposed on imported steel and aluminum. Motor vehicles make up about 30 percent of Japanese exports to the United States. The auto probe follows an April agreement by Trump and Abe to set up a new framework to discuss “free, fair and reciprocal” trade that will be led by U.S. Trade Representative Robert Lighthizer and Japanese Economy Minister Toshimitsu Motegi. Trump has made clear he prefers a bilateral deal to cut a U.S. trade deficit with Japan that hit 615.7 billion yen ($5.64 billion) last month. However, Abe’s administration insists multilateral pacts are still the best bet. Behind Japan’s resistance to a bilateral FTA is in part the fear of pressure to open up its agriculture sector. The farm lobby is an important base for Abe’s ruling party. For now, Japan is working from a familiar playbook with a strategy combining highlighting past and planned purchases of U.S. goods and investments, possible moves sanctioned by the World Trade Organization (WTO) and expanding a web of trade pacts that Tokyo hopes will eventually lure Washington back to the multilateral order. Japan has notified the WTO it reserves the right to take counter-measures against the U.S. tariffs on steel and aluminum totaling $440 million, the amount of added duties the U.S. tariffs would impose on its exports of those products. “We have the right but not the obligation to do it,” the Japanese official said, adding any steps against future tariffs on Japanese car exports would also be WTO-consistent. As they’ve done since Trump was elected, Japanese officials are highlighting how much Japanese carmakers and other firms contribute to the U.S. economy. As of 2016, Japan says its companies have invested a cumulative $421 billion in the United State, creating more than 850,000 jobs. Japan received its first shipment of liquefied natural gas (LNG) last week from Dominion Energy Inc’s newly completed Cove Point, Maryland export plant, the beginning of a jump in imports from the United States. “The balance will tilt toward the United States. Whether it is big enough is open to question but at least things will be happening in the eyes of the president,” the Japanese official said. Japanese officials deny they are foot-dragging on trade negotiations, but some experts said playing for time could be useful. “It’s not Japan that needs a bilateral FTA. It’s the United States,” said former Japanese trade negotiator Yorizumi Watanabe. That tactic, however, risks backfiring.